This year, NaNoWriMo (AKA National Novel Writing Month, AKA November) is going to be different for me. I thought I was crazy to try to write a 50,000-word novel in one month in previous years, but this time, I really am a glutton for punishment. I’m working full-time for the first time in almost eight years, and November concerns me a teensy bit. I’m not worried at all about having a 50,000-word idea. In fact, I already have a novel idea for next year, too. What I’m worried about is not having enough hours in the day to get that idea on paper. If you’ve read my recent posts, you know I participated in Camp NaNoWriMo in July, but although I met my word count goal, I didn’t finish that particular novel in July or even later in the summer. I hoped to finish the first draft by the end of September, giving me October to edit my 2013 and 2014 NaNoWriMo novels (which are the first two books of the trilogy that I will complete this year). But I can no longer carry my MacBook with me wherever I go and write in my spare time. I’ve had to squeeze all my writing into a few minutes after my kids go to bed and on the weekends. At the end of September, I dutifully (but regretfully) set Camp NaNoWriMo aside and started editing. Then one day recently I had a stroke of genius – I can still write longhand. Actually, aside from the inconvenience of having to read and then type my sloppy scrawl, I prefer writing that way. Research shows that writing longhand (particularly cursive, which is how I write) makes what we write stick in our brains better than when we type. It’s how I took all my notes in college, in the dark ages before students carried tablets and laptops to every class. I rarely read over those notes after taking them; it was in the taking that the magic happened. I used to carry a massive folder of loose pages – a novel in progress – with me everywhere, writing when I could. And then, I went back with a pen and edited over my hand-written draft. 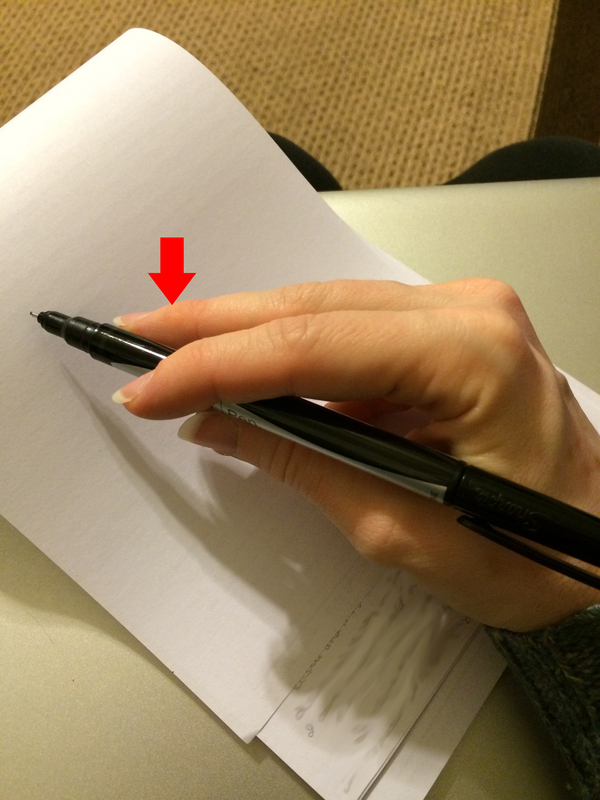 A guy in my fiction workshop saw me doing this once and marveled that I still “actually wrote longhand.” Gasp! Can you imagine? This was still the early 2000s, folks. He would really flip out now, but I’m excited to employ this method again – something I’ve hardly done at all since 2011. You might think that there’s no possible way to write longhand and still validate a 50,000-word novel with NaNoWriMo, but they have a specific guideline for just this issue (read it here). Would it be a bit of a pain to keep track that way? Sure. But it’s possible. And who knows – maybe something magical will happen if I write this novel (or a good portion of it) by hand. It’s certainly a more laborious process, but it’s better than the alternative – letting my ideas fade because there’s not a word processing program nearby, losing the thread of my novel in the absence of technology. As for Camp NaNoWriMo’s novel, I’m still working on it, pulling a pad of paper out of my purse and adding to it one sentence at a time. I may not be able to finish it until after November, but as long as I carry a writing implement and paper with me, I’m ready when inspiration strikes. I am excited about NaNoWriMo. I know I’ll at least be able to type on November first, and maybe I’ll make up for the time I miss during the week on weekends (and our super long Thanksgiving break – yay!). My fingers are crossed, and I’m ready to go. Maybe I’ll even regain the mark of the writer, my good old friend, the callous on the finger where my pencil rests. This entry was posted in Writing and tagged Camp NaNoWriMo, Cursive, Editing, First Drafts, Longhand, NaNoWriMo, National Novel Writing Month, Novels, November, Typing, Writing, Writing Longhand, Writing Process. I know what you mean about writing longhand, especially in cursive. My thoughts always come out better when I’m writing longhand. I bought my Netbook so I could use it for my first NaNoWriMo, but typing seems to come from a different part of the brain. I may not be on the NaNoWriMo bandwagon this year, though I do still have a few hours to think about it. Even if I’m not writing this year, I certainly will be supporting you brave folks who are. I wish you luck and free-flowing inspiration in all your writing endeavors. Thanks! I am getting pretty excited.